I just had to read this new Danish crime novel after reading a reviews online (which you can read here) and I wasn’t disappointed. The novel is told in alternating chapters, firstly the present and then events that happened five years previously. It took me a few chapters to get the hang of the two stories and see where they were leading, but once I got into the book I couldn’t put it down. Here’s a synopsis from Penguin Australia’s website who is the publisher. At first the prisoner scratches at the walls until her fingers bleed. But there is no escaping the room. With no way of measuring time, her days, weeks, months go unrecorded. She vows not to go mad. She will not give her captors the satisfaction. She will die first. Copenhagen detective Carl Morck's been taken off homicide to run a newly created department for unsolved crimes. His first case concerns Merete Lynggaard, who vanished five years ago. Everyone says she's dead. Everyone says it's a waste of time. He thinks they're right. Adler-Olsen builds the suspense really well and the characters are interesting and a little irreverent – not at all like the attractive, glossy detectives that feature in a lot of the American crime fiction. Carl would much rather have a nap, or play games on his computer than tackle the files on his desk. I particularly liked Carl’s sidekick, Middle Eastern immigrant Assad, who is engaged as clerk, cleaner and general dogsbody to the new Department Q but has some hidden talents – his keen observation of the smallest details and where did he learn to use a switchblade so effectively? 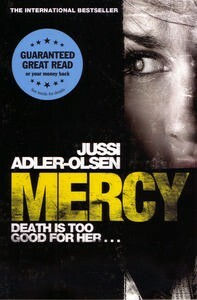 I have to say that I don’t envy the victims in Scandinavian crime novels as they seem to have the most extreme situations, and this is no exception in Mercy but I won’t spoil the story by giving away the answer to the question posed above.